Reacting to chronic complaints that Office applications have become unwieldy with endless menus and features, Microsoft is developing a streamlined presentation application built from the ground up for mobile devices and cloud computing. The new Office app is called Sway and can be used to create a wide variety of things, including documents, flyers, presentations, albums, publications and Web pages and reports that contain elements like text, tables, photos, videos, music and animations. 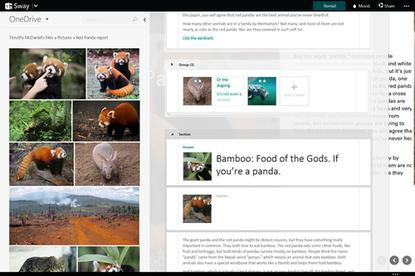 Sway has been designed to let users easily post their creations online and share them via social media. Sway eschews the conventional menu-intensive interface of Office applications and relies mostly on graphical icons that users can click on to execute actions, and on drag-and-drop capabilities for formatting their creations. An underlying algorithmic presentation engine arranges the Sway designs on the fly and generates layout suggestions for users. Sway, which Microsoft unveiled on Wednesday in preview mode, seems a good addition to Office, given that a number of competitors have come out with authoring applications of this sort positioned as more modern, friendlier options to Microsoft's venerable productivity app triumvirate of Word, Excel and PowerPoint. In fact, it seems that Sway could be the blueprint for the future of Office applications, especially as Microsoft toils on the touch-first version of the suite for tablets, in the sense that it tries to simplify the user experience by being more "intelligent" and aware of what people are trying to get accomplished, and proactively helping them. "Sway helps you focus on the human part: your ideas and how they relate to each other. Sway takes care of the design work -- a Sway is ready to share with the world as soon as it is born," reads the blog post announcing the application. In a 17-minute video about Sway, David Alexander, an Office senior product manager, said one motivation behind Sway's creation was the abundance of Web and mobile apps that focus on narrow aspects of authoring, forcing people to learn and use multiple programs. "Now we're in this position where people would love to take all of their ideas and content and just give it to a digital assistant and have them do all the hard work and heavy lifting to create a polished, cohesive output, and that's what Sway really provides," he said. From the moment a user starts working on a Sway "Web canvas," the design engine formats the elements in real time cohesively, and analyzes and "learns" from the user's actions, incorporating that input into its assistive algorithmic calculations, according to Microsoft. "You can adjust and customize the format Sway has created in easy and intuitive ways. Want a picture to stand out? Don't worry about exact pixel heights and widths or whether you have the design chops to keep things looking good. Just tap or click the image in your Sway and tap or click the star icons to emphasize it," the blog post reads. Sway adapts its output to a variety of screen sizes so that the Sways look properly formatted in smartphones, tablets, PCs, large displays and the like. Sway works from browsers and via a mobile app, and can grab content directly from OneDrive, Facebook, Twitter, YouTube and local device storage. Microsoft plans to expand this list of sources from which Sway users can aggregate content. Those interested in giving Sway a try can request access to it by submitting their email address to Microsoft on Sway.com.